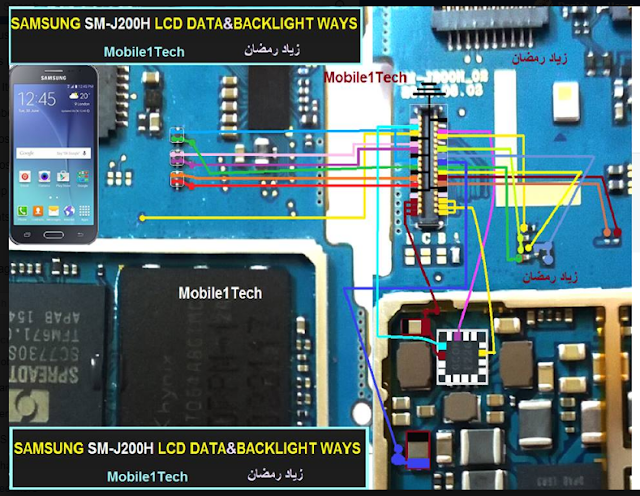 SAMSUNG SM-J200H is its LCD DATA&BACKLIGHT problem, In Samsung Galaxy J2 J200H Display is connected the the motherboard with a cable connector. If your LCD is not working, you obviously have to check if a faulty LCD is not causing this problem. If the LCD is okay then check the LCD connector. If you ever already been tried to replace a new LCD screen and new flex cable wire and nothing happens but the display problem still exists like, black screen display, blue screen display, white screen display, garbled and saturated screen display. Before you may proceed, you need to make sure first that the flex cable and the LCD is working fine or you have it tried with new replacement installed but nothing happens. Note: this solution covers only for hardware repair and may not help on software related issues. The very first thing that you should do is to check Display connector and check for any loose end, if it is fine then check it with another good LCD screen. If Display connector is faulty or damaged, replace it and check it with the same or some other good LCD screen. If that doesn’t work then check the filters of your display connector.